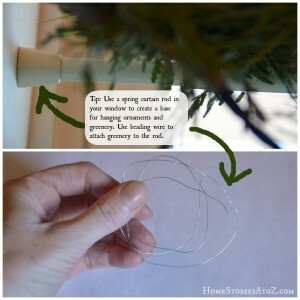 I am currently waist deep in Christmas bins right now preparing for Just a Girl’s Holiday Home Tour which kicks off this Monday, but I wanted to pop in and share a semi-DIY antler ornament tutorial with you. I found these antler ornaments at Walmart for $1.97. Each ornament came with a set of antlers tied together adorned with some brown bells. They were cute but just a bit too “lodge decor” for the look I wanted. 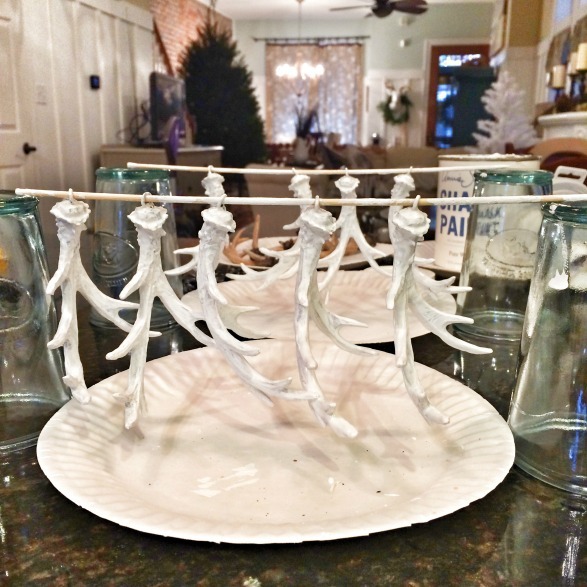 I separated the antlers, removed the bells, and painted them white with chalk paint! Instead of using a paint brush, I found it easiest to wear disposable gloves and just dip my gloved fingertips into the paint. I then “massaged” the paint over the antler and hung it on a skewer stick-suspended between two glasses-to dry. You could certainly use a paint brush for this project, or spray paint, but honestly this method is probably the quickest and easiest. 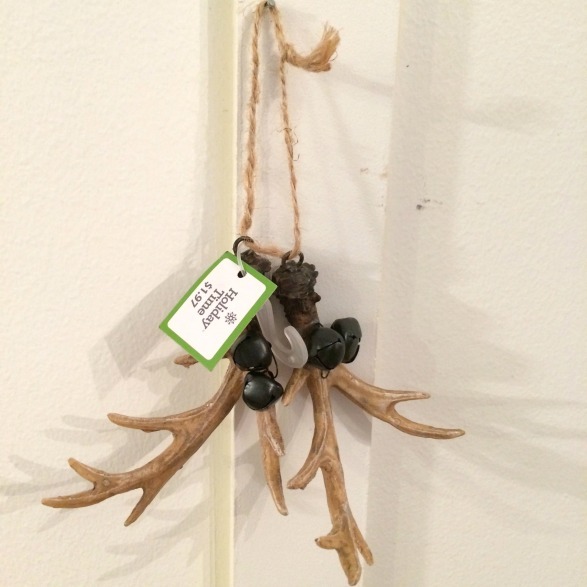 The chalk paint gives the antlers a nice matte bone finish. If you want them to be shiny, rub them with clear wax. Aren’t they cute? 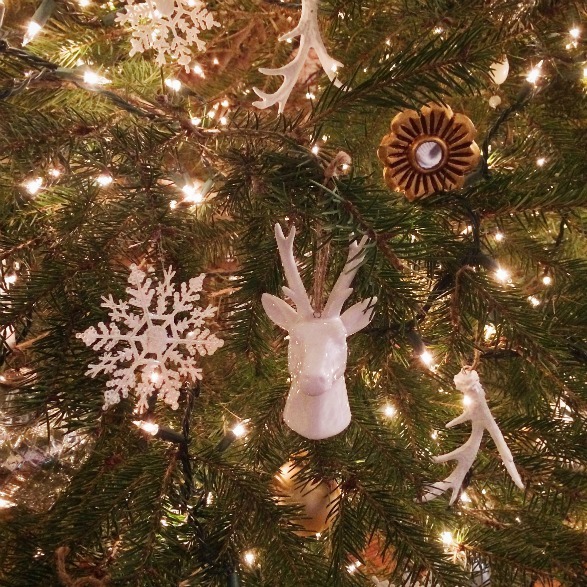 I paired them with my deer ornaments found at Lowe’s and love the woodsy feel of my tree. 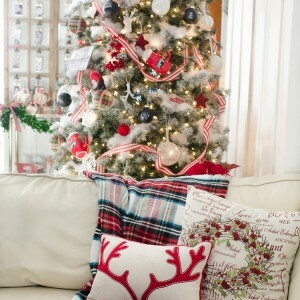 Okay, back to Christmas fluffing and crafting I go! 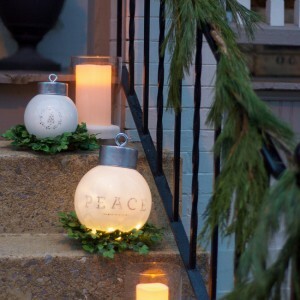 I’ll pop back in shortly to share another easy Christmas DIY with you! How is your Christmas decorating going? Are you done yet? Love your site, please sign me up. Such a great idea.. They Look incredible!! Good luck Beth! 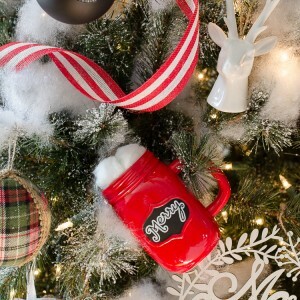 Maybe you can dream of a white Christmas tomorrow night. 😉 I know you’ll do a beautiful job! 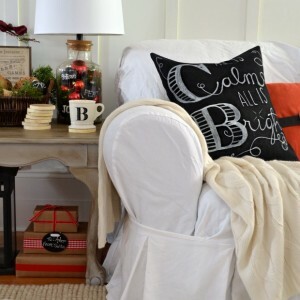 How fun, I love the antlers, such a cute idea.